Right, the war’s finally over, before Christmas too, just the wrong one, and me and my mates want to go home. Sort it out please. And, of course, over the ensuing months, thousands of staff officers did, although not as quickly as many hoped. 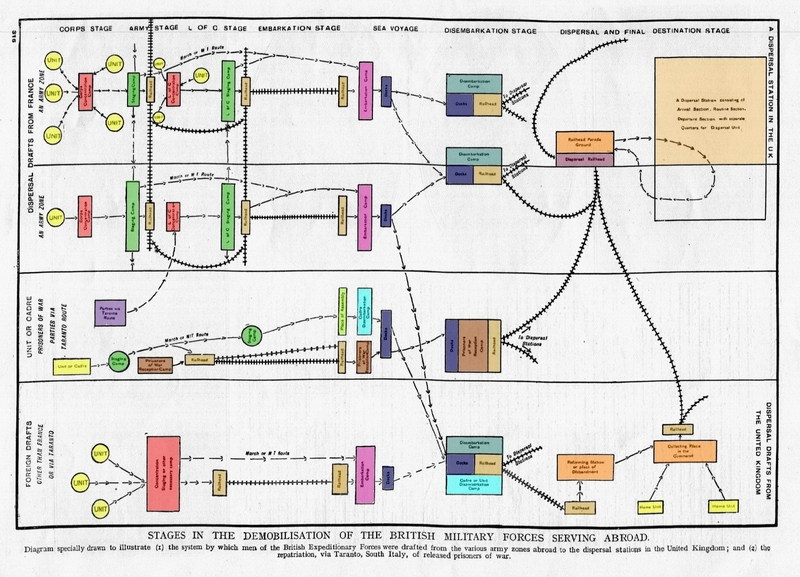 I discovered this diagram in a July 1919 edition of the Great War Illustrated magazine, added the colours, and found myself pondering on the complexities of demobilisation after the war. The images used in this post all come from that and the following issue, the photos now in the public domain as far as I can check, which is all you can do. 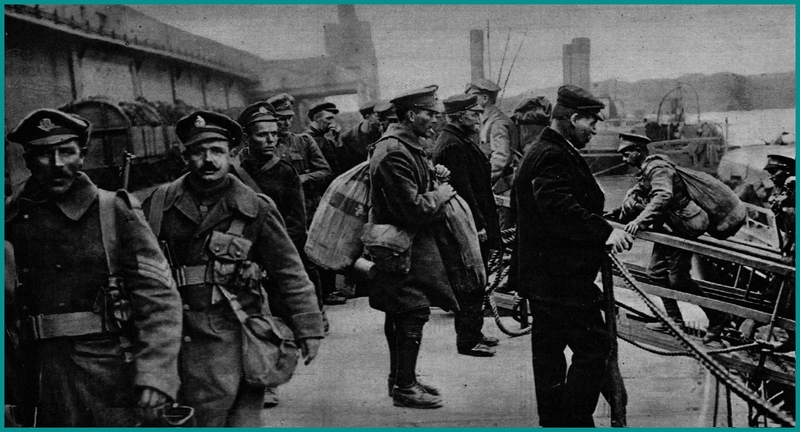 Those immediately below show, top, British troops on the quayside at Cologne preparing to board a steamer to take them down the Rhine to Rotterdam and home, bottom left, soldiers from hospitals in France awaiting embarkation at Havre, and bottom right, men on board a troopship on the week-long journey from Egypt to Italy, from where they would return to the U.K..
Demobilisation of the British Army was a somewhat different affair to that undertaken by the armies of France and Italy. There, the vast conscript armies could be demobilised with comparative ease and relative speed by the simple expedient of releasing men from service in yearly classes. In Britain, agriculture, transportation and, in particular, industry, faced the challenges of changing from a war footing to a peace footing, necessitating huge reconstruction work as factories, many built specifically for war purposes, were converted for peacetime work. Indiscriminate demobilisation of men would undoubtedly have resulted in considerable unemployment, quite literally the wrong men with the wrong skills might be released, while the right men with the right skills remained as soldiers, so it was decided that, rather than flooding the work market with men, individuals would be demobilised on a personal basis, primarily based on the requirements of industry. Above & below: R.F.A. gunners arrive at Dover from Salonika for demobilisation. Some had not been home for four and a half years. The British military and civil authorities were far from ill-prepared for demobilisation, having already created a complex and comprehensive demobilisation scheme consisting of fourteen phases, the first of which involved the creation of a military organisation within the army to carry out the whole process of releasing men. Phase Two, crucially, involved the reconstruction of Britain’s industrial base, the compilation of an industrial priority list, and the arrangements for transporting individuals to the areas they were required. Phase Three involved transportation by sea, including chartering of ships, coaling, wharfage storage and accommodation, for the thousands of men serving outside Europe, as well as transportation home from France, without which Phase Four, transportation by land, would founder. Phase Five was the creation of a post-bellum army, Phase Six involved the care of those unfit to return to civilian life, Phase Seven storage of armaments, equipment and ammunition, and Phase Eight the disposal of surplus animals, vehicles and stores. Phase Nine covered the disposal of personnel on cessation of military employment (see men’s entitlement on demobilisation, a little later on), and Phases Ten, Eleven & Twelve covered disbandment of units no longer required, final settlement of payment due, and final adjustment of the accounts of units. Phase Thirteen dealt with the preparation of plans for remobilisation if required, and Phase Fourteen covered repatriation of prisoners-of-war, both evacuation of those of the enemy, and the return of British POWs from abroad. A Special Army Order of 21st October 1918 laid down that every individual soldier should have his industrial group (the Ministry of Labour detailed forty three groups) and actual trade recorded in his Army Book 64, thus allowing the War Office to establish the exact composition, by industrial groups, of its armies, both at home and abroad. The U.K. had been divided into nineteen areas for the purposes of dispersal and distribution, the Ministry of Labour advising the War Office the priorities of the industrial groups, and a daily allotment of men were made ready for dispersal, an equal number chosen from home and abroad. Throughout, your quickest chance of being demobbed was if you were a coal miner. 50% of each draft was to be composed of miners (some had already been released from service during the last six months of the war due to the national coal shortage), the remaining 50% to consist of, in order of priority, men required by the Government to work in connection with demobilisation, men whose return to work would provide employment for others (known as pivotal men), men with specific skills urgently required by industry, those with approved offers of employment, men over the age of 41 (the age would reduce to 36 as the months passed), men discharged from hospital and convalescents, and men of Group 43, which included all aspects of the teaching profession and students. Officers and men who had pre-war training or work to return to, whose names were put forward by the Ministry of Labour, were also added. 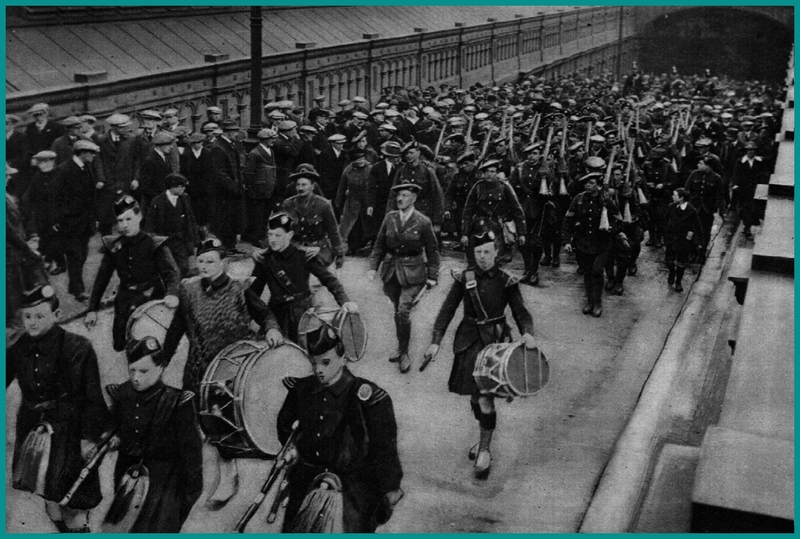 Arrangements were made for prisoners-of-war, after arrival in the U.K., to be sent to P.O.W. 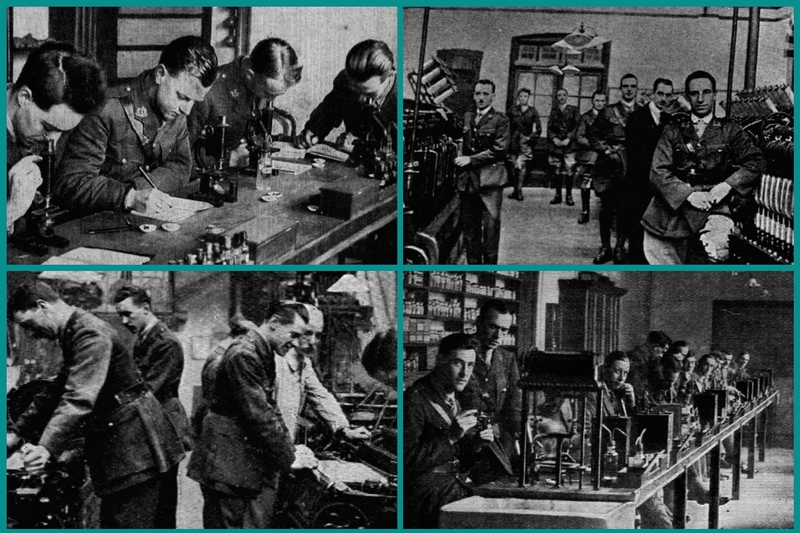 Reception Camps for recuperation and reuniting with relatives, and nurses would be released by the Ministry of Labour depending on the army’s current needs, length of service, age, health, domestic situation, etc. 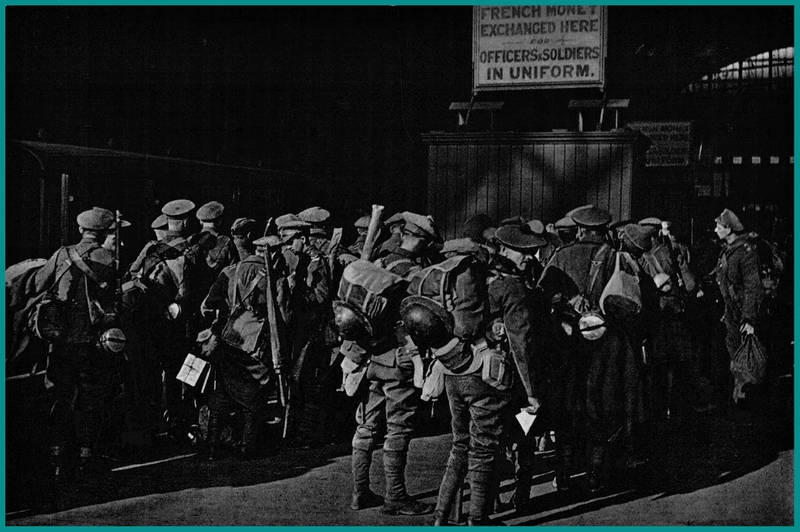 It was estimated that on a selective basis, as the British had adopted, some 10,000 men could be dealt with on a daily basis and transported from France to the U.K., and on a non-selective basis 23,000 (hence the French demobilised much quicker than the British). The demobilisation of Dominion & Colonial Forces was largely dependant on tonnage and available shipping, but some troops were sent straight home from France, while others returned via the United Kingdom, where their dispersal was arranged by their own governments. Above: The arrival of 4th Bn. Royal Scots in Edinburgh. 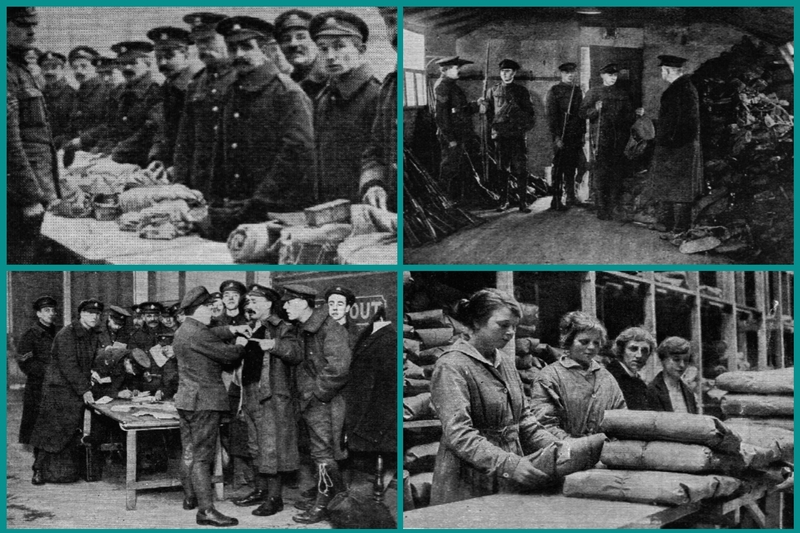 Below, top row, final kit inspection (left), handing in rifles and equipment (right), and, bottom row, men passed for demobilisation being measured for civilian clothes (left), and women packing suits for demobbed soldiers (right). On demobilisation, every man, with the exception of officers, was entitled to 28 days furlough with full pay and allowances, an unemployment donation policy, valid for a year and payable for a maximum of twenty weeks, a rail warrant home, a suit of plain clothes, or an allowance in lieu, and a protection certificate. The men could keep their uniform and boots, but I’ll have that greatcoat back, sonny. The conditions of demobilisation for officers (not the regular ones, of course), of which 3% of the daily draft was to consist, were roughly the same, men with employment awaiting them who were no longer required in the army topping the list. 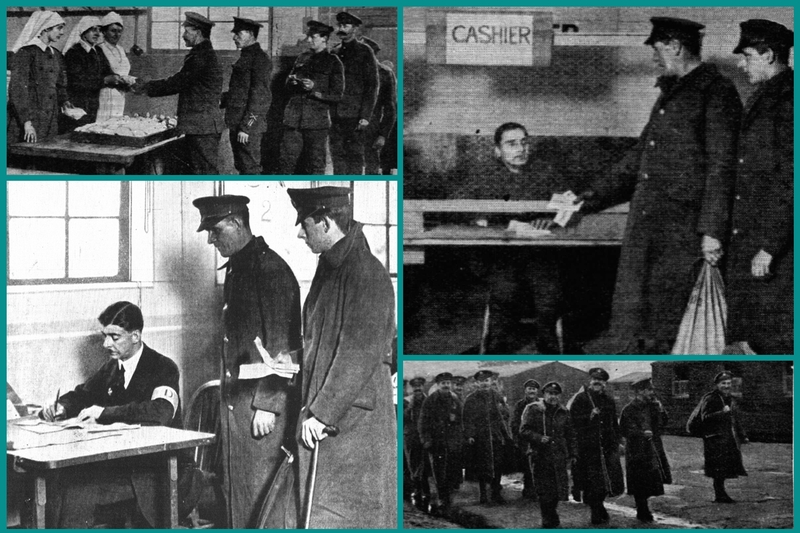 Below: Demobbed soldiers drawing rations (top left), receiving their unemployment policies (bottom left), drawing their pay (top right) and leaving dispersal camp, Wimbledon in this case, for home (bottom right). Unfortunately, the best laid plans, and all that. As November & December passed, amendments were made to the plan; officers and men based at command depots could be demobilised, and it was decided that all Group 43 men who wished would be immediately released. Men discharged from hospital after 11th November, who had spent twenty eight days or more under treatment, could be sent home for demobilisation as soon as shipping allowed. Although eleven dispersal stations had been set up across Britain by mid-December, these and other amendments, in particular the problem of men on leave, as we shall see, impinged on the smooth running of the original plan. It was all happening far too slowly for an impatient public, who wanted their loved ones home, and impatient employers, keen to add skilled men to their workforce, whose applications, it seemed, were receiving little response. Families and friends of absent soldiers began to clamour for an immediate speeding up in the whole demobilisation process, the daily press swiftly taking up the baton. Below: Officers undergo retraining. Along with the 10,000 men being demobilised each day, by the end of 1918 some 7,000 men on leave were passing between Calais and Folkestone on a daily basis, adding to the burden on shipping and dockside accommodation. 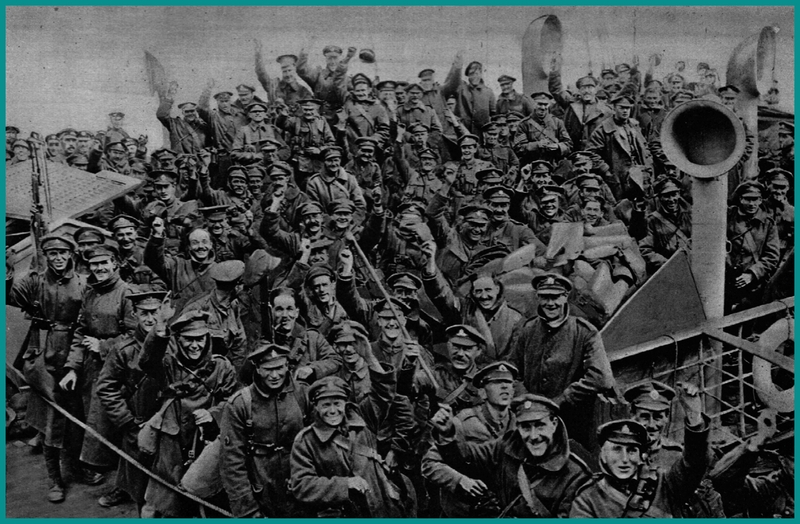 Men were constantly arriving home on leave, and it was decided that pivotal men and others should be demobilised immediately rather than returning to their units, adding around 1,000 to the daily discharge. In time this would be extended to any man who could provide written proof of employment by an employer for whom he worked prior to 4th August 1914. As a consequence, large numbers of men were released with no regard to the agreed order of industrial priority, and grievances were commonplace. Men to be released on compassionate grounds were added to the list at the end of December, but still the rate of demobilisation was causing dissatisfaction. Envious glances were cast towards France and America, where demobilisation was making great progress, and it seems that although the War Office were well aware that British demobilisation was not proceeding as planned, they could not act fast enough to rectify the situation. Officers over the age or 51, should they wish to leave, were added to the list in early January, and it was decided that one in ten of the dispersals from France should be long-service men. 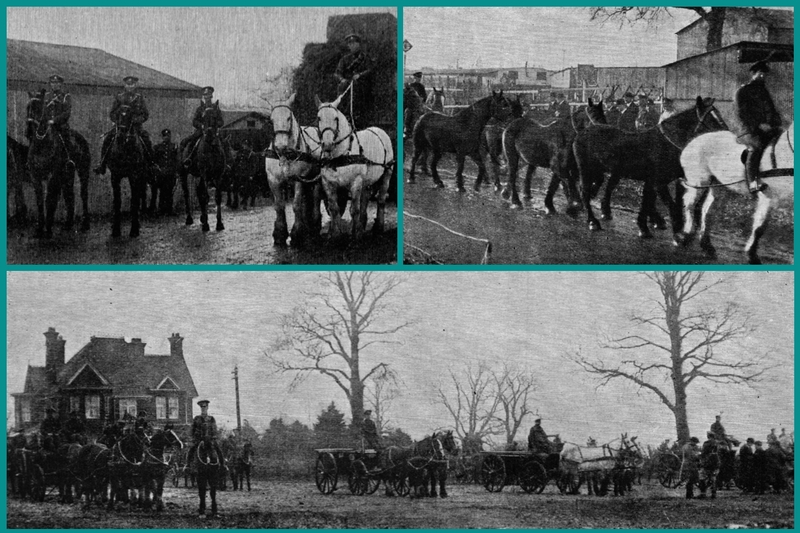 Below: Demobilisation of horses – 25,000 animals were demobilised in the first three months following the Armistice. The top images show hunters and draught horses – note the bowler-hatted gentlemen behind the horses (top right), presumably vetting their prospective purchases – and squadron waggons, drawn by heavy draught Shire and American horses and mules, lined up on the sale ground (bottom). Nonetheless, early in the New Year the situation reached boiling point. Around 10,000 soldiers on leave and staying in rest-camps in Folkestone staged an orderly demonstration at the slow rate of demobilisation, I think, in simple terms, because their leave was coming to an end and most expected to be demobbed rather than return to their units. The military authorities, to give them credit, dealt with the situation, and a similar one that arose at Dover, even-handedly, by promising that the men’s cases would be dealt with on an individual basis. Nevertheless, throughout the first week of January, other demonstrations up and down the country followed the one at Folkestone. 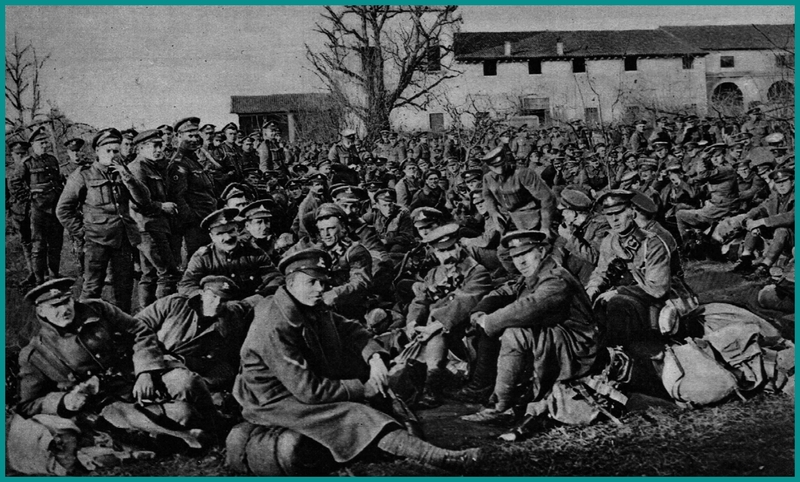 By 8th January 1919 some 300,000 had been demobilised, the rate of release of pivotal men now around 4,000 a day, and the following day the Government issued a long statement appealing for patience from both soldiers and public, that everything possible was being done to hasten the rate of demobilisation, and that sympathetic hearings would be given to all legitimate complaints. Interestingly, the Army Council gave notice that from now on all men on leave would return to their units unless in exceptional circumstances, rather than the previous system that, because of the leave rota system, in practice saw many six or nine monthers demobilised before their long-service colleagues, causing ill-feeling and resentment among the troops. Amendments were made to the plan, and the government statement seems to have had an effect, the last demonstration taking place on 9th January. 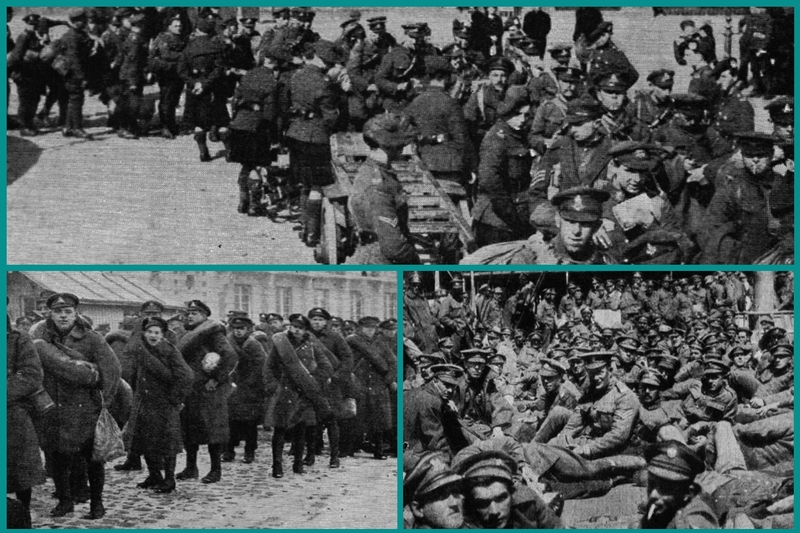 Below: Soldiers on leave after marching to Whitehall in protest at being sent back to Salonika – it was agreed that those who had work waiting would be demobbed (top), soldiers with positions in civil occupations to which they could immediately return queueing at a Labour Exchange to have their papers endorsed for early demobilisation (bottom left), and Lord Gort V.C., amiably discussing the situation with demonstrating men of the R.A.S.C. on 8th January (bottom right). By 12th January 70,000 applications for pivotal men had been received and the number of these men released each day had risen to 6,000, 125,000 miners had been demobilised, and the daily dispersal draft had doubled to 20,000; within a week this would rise to 30,000. 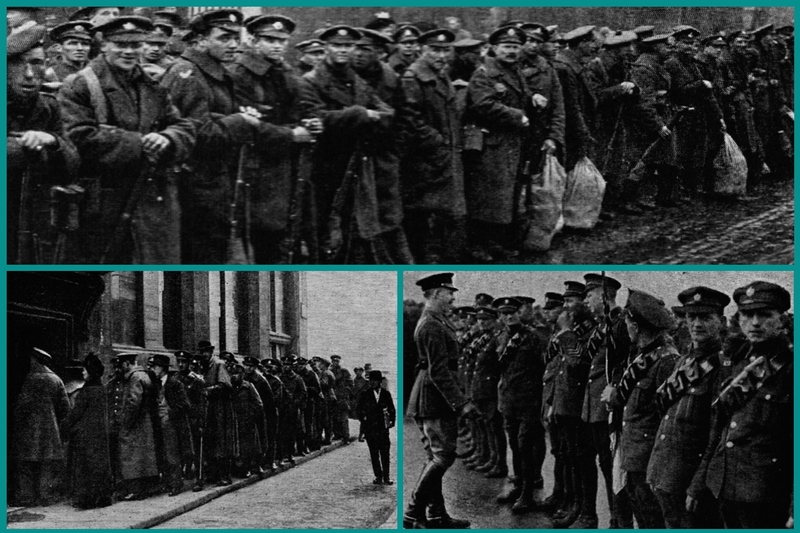 140,000 men a week were now being released from U.K. commands alone, preparations for the Army of Occupation required in Germany were well established, allowing more men to be promised demobilisation as soon as their units could allow it, and from this time onwards the process proceeded relatively smoothly, with few complaints. 3rd February saw the daily number rise to over 43,000, by which time a total of 25,334 officers and 1,087,005 men had been discharged. Six weeks later that number had risen to 57,082 officers and 2,052,460 other ranks. Gradually the age of retention was lowered from 36 to 35 to 34, men with two wound stripes were added to the list (I suppose so many men had one wound stripe that chaos would have ensued had they all been released), and in time the Army was left with the 900,000 men required to form the Army of Occupation. Below: the first draft of men from Italy preparing to return home. Demobilisation, a vast, complex, and on this scale, unique task, was for the most part complete. The demobilisation and resettlement of the three million war workers scattered across the United Kingdom, taking place at the same time, don’t forget, is another story altogether. This entry was posted in 1919. Bookmark the permalink. Another interesting and different aspect of the period. Also another myth, war finishes everyone goes home, of course logically no considering the scale. Prompted me to check the demob records of the three members of my family surving the conflict. One I can’t read a date, badly damaged record, beyond moved to reserve army (originally infantry 1917 onwards). Second (sapper 1915 onwards) seems to have been demobilised April 1919. Third (pay corps from 1916) seems to have moved to reserve in March 1919 but not demobilised until March 1920, but maybe needed to administer pay until the end? Certainly army life continued beyond 1918 logistical nightmare I guess but I wonder how it compared to 1945? Hello Mark. You have done it again! For which I thank you once more. I have slightly changed the end and added ‘for the most part’ thus: ‘Demobilisation, a vast, complex, and on this scale, unique task, was for the most part complete’. Which is what it should have said in the first place, because you are quite right – for all sorts of reasons, many individual soldiers were demobbed later – and I would not be at all surprised to find out that the pay corps was part of the organisation within the army carrying out the whole demob process, hence they were not demobbed until later. Maybe? I couldn’t help thinking about 1945 too when I was writing all this, but I have no idea how it worked then. Yet another very interesting aspect of the complexities of war that many of us would not have known. Are you contemplating a follow up on how Commonwealth countries soldiers were sent back home then demobbed? My father’s progress was from being wounded to hospitalisation in Bristol; shipped back to Australia for further hospitalisation and finally demobbed. Similar to UK there were retraining programs. After years of regimentation in horrendous Theatres of War it beggars belief how most readjusted to civilian life. In 1954 as an Apprentice and now 8 or 9 years after WW2 overseas service demob, returned soldier workmates chatted at “smoko” (morning-afternoon tea breaks) of their wartime experiences as though it were yesterday. I learned much from them. 4 or 5 years away from family and civilian life had a massive effect on their lives and I expect the same consumed post Great War soldiers. Hello Sid. To answer your question, I thought I had covered that with: ‘ The demobilisation of Dominion & Colonial Forces was largely dependant on tonnage and available shipping, but some troops were sent straight home from France, while others returned via the United Kingdom, where their dispersal was arranged by their own governments.’ Which translates as, ‘I don’t actually know exactly what arrangements were made to get the Aussies, Canadians etc home, but I do know they made their own arrangements’. If anyone fancies doing the research, I shall consider (consider – no promises) whether there is another post there (which also depends on photos available too). I too have no idea how you adjust to post-war life. Beggars belief, as you say. Damn you Carruthers. Maybe later then. Another reminder might be required. To be fair, I am paddling away frantically behind the calm exterior of the website on so much stuff at the moment (along with spur of the moment stuff – this whole Demob post was conceived, written and published in about four days, the total opposite to the recent Hooge post which took years – I hadn’t even considered it this time last week) that a reminder will almost certainly be required. But I shall try to keep it in the back of my mind in case I stumble across relevent stuff in the meantime. This was/is a brilliant post M. Made me think about so much of the logistics of trying to get the army etc home when hostilities ceased. Something you don’t readily think about. The numbers are mind boggling and then the livestock and equipment wouldn’t know where to begin. Thankyou for making me think about it. And all conceived and written in a few days, M. I’m glad you liked it, and that it made you think (made me think too), because it is something you don’t readily think about, as you say, and we all know a bit more about it now.